The only reason I’m posting this picture is because that fire truck says “City of Seattle” on the side of it and I love Seattle! haha. When I took this I was walking out of an art supply store and saw zooming by. I quickly threw my camera in front of my face and snapped this shot. Not much to it really, but I got what I needed from it :). 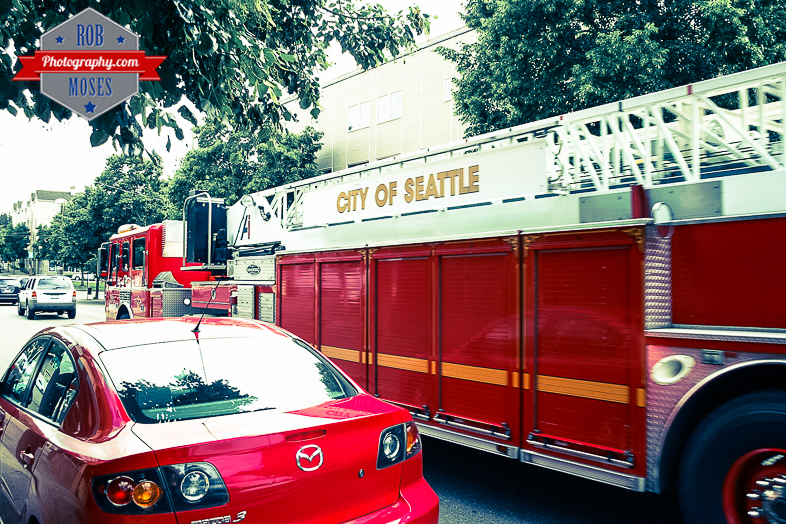 This entry was posted in Cities, Random and tagged 1D, 1D mark ii, 1Dmarkii, 24mm, 3, Canon, city, City Life, city of Seattle, fire, fire truck, Mazda, Mazda3, metro, pacific north west, photo, Photography, PNW, random, Seattle, street, Urban, USA, WA, Washington, zoom, zoom zoom. Bookmark the permalink. Ya lots of red in this one hey haha. You meant to say you ‘professionally’ threw it in front of your face. 🙂 What a great shot!